The right product can make all the difference in your business. With eBaTool, Our data-driven sales estimates show you exactly what’s selling, and the detailed info we provide you for any listing lets you be sure you’re setting yourself up for success. Extension help you to find all informations when you are surfing ebay in Chrome. The best part all good and profital products, collected and selected by most solded. just for you. eBaTool is a great tool based on tow ways to find your winner products. and include the most important features to do. 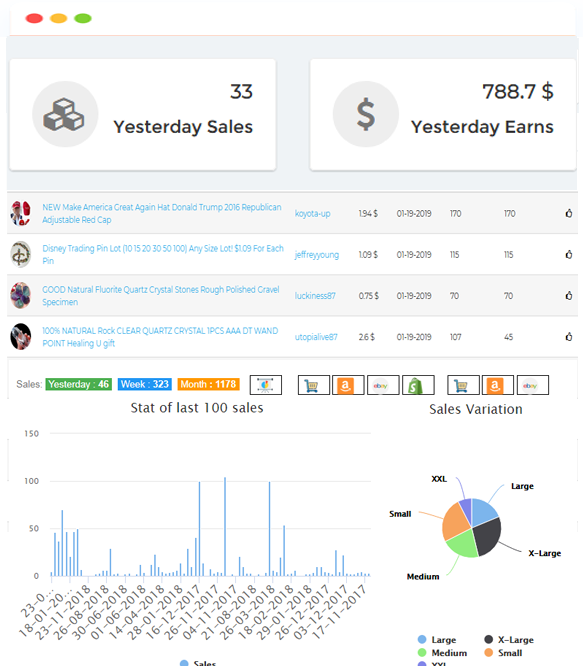 The Tool comes with the features to analyse and know what products is good to start an online business. The easiest way to find products that sell. Find niches where opportunity is high, with real sales data. Say goodbye to manual research and save your precious time for things that matter. Install it in Chrome and start you own adventure to be rich by finding manualy a winner product. Does all jobs to give you all best products in this week, day with the good profit. © 2019 eBaTool. Theme by Creative Tim.